Let’s face it, sometimes Christmas can be a little stressful so we want to make it easy. FREE Delivery over $100 OR Click & Collect. Set products and sizes. Limited variations available. Pick Up ONLY from Ashgrove or Rosalie store. More products, sizes and variations available. * Click on the Christmas category (hover over Shop Online to view this category). * Select your Christmas goodies and add to your cart. * Remember, this is a smaller selection of Christmas basics compared to our extensive in store Christmas Order form. If you would like to order from a great range of options, scroll down to learn more about how to place an In Person order. (a) Delivery – Christmas orders can be placed online now, for delivery from Monday 3rd December to Monday 24th December (weekdays only). 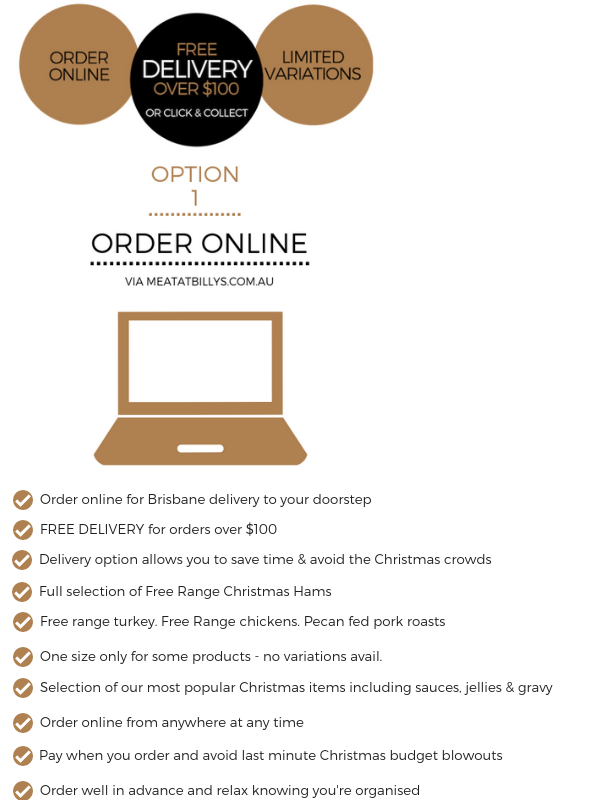 For weekday deliveries prior to this contact us at info@meatatbillys.com.au. * Like all Meat at Billy’s online orders, payment is processed at the checkout. 1. 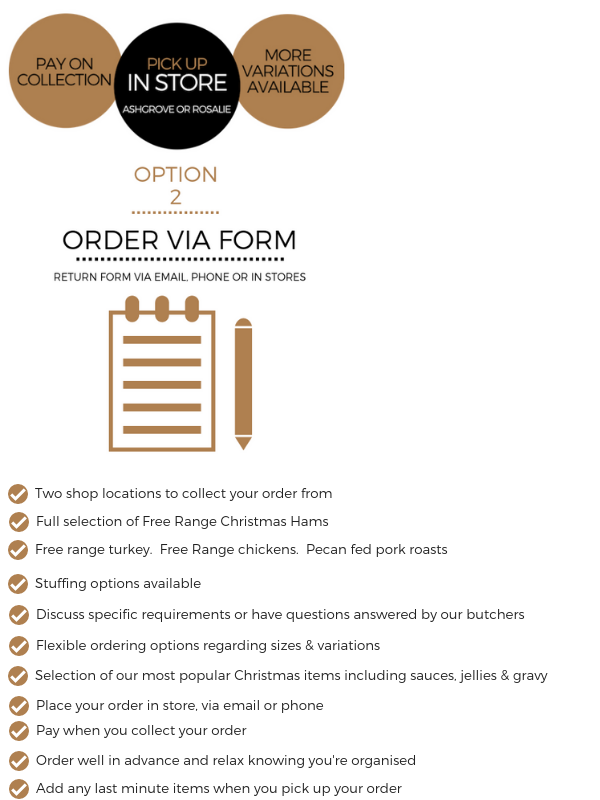 DOWNLOAD your Christmas Order form (or use the one you may have received in store). * This form is used to pre-order items that you will collect from Ashgrove or Rosalie stores on a date that is convenient for you. * It details an extensive list of in-store options including various sizes, stuffings and marinades etc. * Select your Christmas goodies and fill in the form including quantities, sizes stuffing types etc, where applicable. (a) In person – Take your form into the Ashgrove or Rosalie store and our butchers will complete your order in store. * If you emailed OR phoned in your order, your confirmation Order Number will be emailed to you. * Payment in full is made when you Pick Up your order from the store you placed your order with.